HTML Executable creates ebooks not only with HTML pages but also with PDF files. You can compile several PDF documents into one single EXE file. As for HTML pages, PDF documents are secured because they are compressed and encrypted. The built-in PDF engine used by HTML Executable handles almost all PDF documents fine: PDF files created by popular printer drivers, Adobe Acrobat, Microsoft Office or OpenOffice should be displayed and printed fine. However, PDF files created by imaging and advanced publishing tools may not be properly displayed. If this is the case, printing your PDF document using a printer driver such as PDF Creator may help. 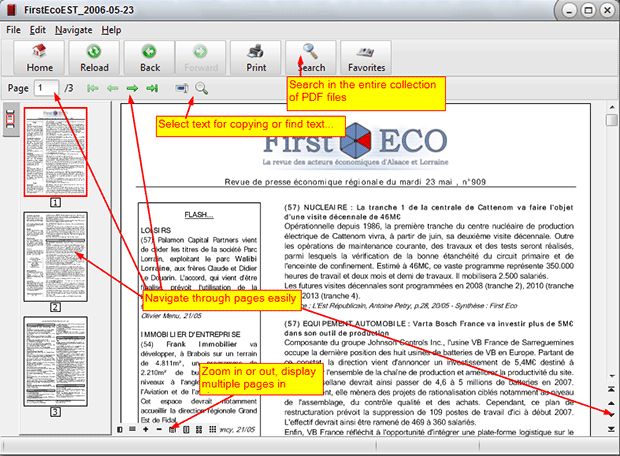 Using this built-in PDF viewer lets you keep your PDF documents as secure as possible: they are not unpacked to the hard disk, so they cannot be copied. Non-Latin characters are correctly rendered by the PDF engine. HTML Executable comes with a sample with various PDF documents that lets you test the PDF engine's robustness. PDF files are indexed by the built-in search facility like HTML pages and included in search results. Click Search in the toolbar and enter anything that you want to search. HTML Executable will automatically search through the entire collection of PDF files that were compiled in the ebook. Of course, you can exclude PDF files from being indexed if you want. You can directly link to specific pages by number or named locations in compiled PDF files. Distribute your PDF documents more easily on CD-ROM or online. Forget about other redistributables or third-party application requirements since the PDF rendering engine is stand-alone.